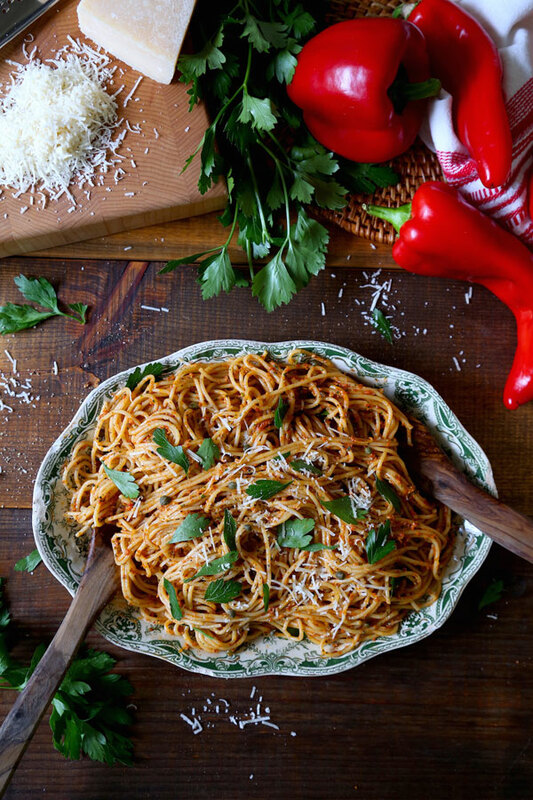 Something very lovely happens to red peppers when you roast them. They become infused with an irresistible aroma and filled with a sweet syrup. 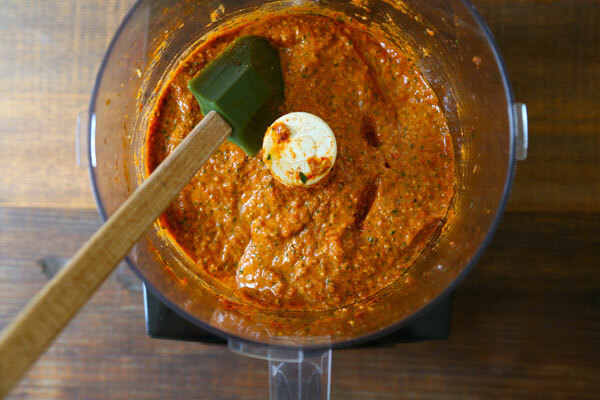 This recipe uses roasted red peppers to make a rich pesto that is delicious on pasta, bruschetta, polenta, etc. The options are endless. One of my very first blog posts was about my friend Tonya’s amazing red peppers which she grows on the rooftop of her garage in downtown Toronto. I was blown away that she could grow such bounty on her city rooftop, and I made this video with her, showing her pepper harvest and the creation of her wonderful roasted red pepper ketchup. 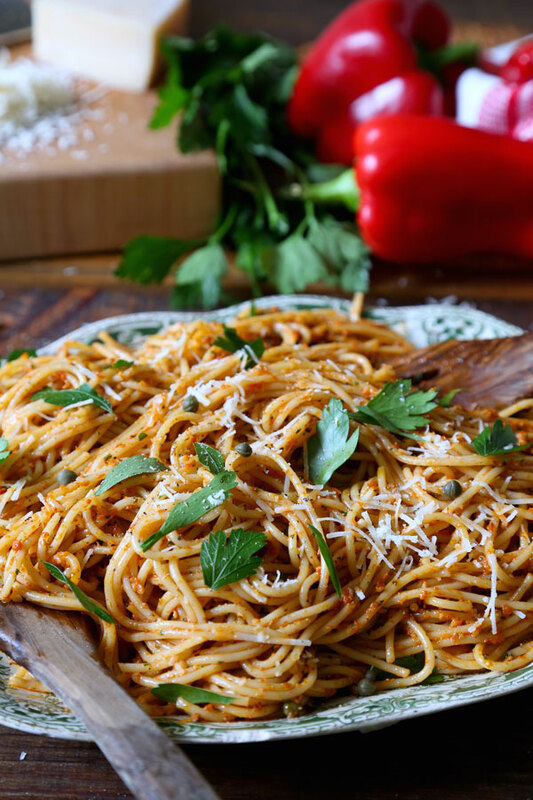 The gorgeous peppers I used in my pesto are a variety called Carmen. They were grown organically by our friends at Banner Farm, and their flavor is outstanding! However, you can use regular red bell peppers instead. Any sweet red pepper will do. Do try to find farm-fresh Carmen peppers if you can though, in my opinion they do have more flavor. Though it may look alarming at first glance, roasted peppers should have fully charred skins in order to get that deep roasted flavor. Don’t be afraid to singe them well, the burnt skin slips off very easily and you’ll be left with nothing but the tender red smoky-tasting flesh inside. However, do take your time, the charring shouldn’t happen too fast because the pepper needs time to cook and soften all the way through. I roasted my peppers on a wood fire but you can do it over any flame (a propane gas burner is fine), or as a last resort, roast them in the oven. Once they are soft and well blackened, remove them and place them in a lidded pot or in a paper bag. Avoid using a plastic bag because it could melt. There are many variations of this recipe. You could use almonds instead of the walnuts, or basil instead of the parsley. Feel free to play around with it to suit your personal tastes. Bon appétit! 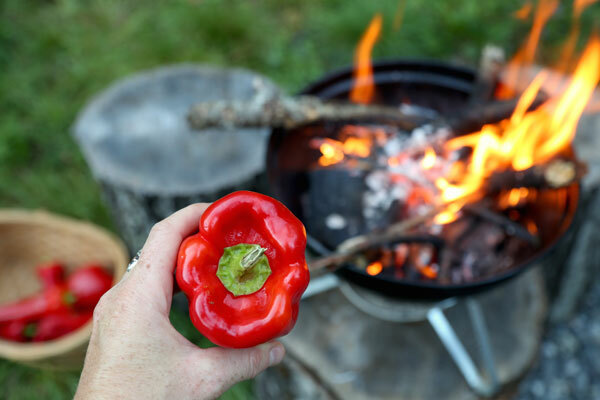 Roast the peppers over any kind of flame (wood fire is best but a gas burner will do). Your flame shouldn’t be too harsh so that the pepper has time to cook and soften inside while its skin chars. Place the pepper directly on the flame and turn it often, using tongs. Once it’s all blackened, immediately place it a tightly lidded pot or in a paper bag. Let it cool for about 15 to 30 minutes. As it “sweats”, the skin will separate from the flesh and become very easy to peel off. Peel the skins, scrape off the seeds, and your peppers are ready. (If the skins were hard to remove and it gets very messy, you can rinse off the peppers flesh, but it’s better if you can avoid this because the juices have a lot of flavor. An alternate way to roast the pepper is in the oven, on a baking sheet for about 15 minutes under the broiler (keeping an eye on them and turning over as needed) or for about 50 to 60 minutes at 450F. 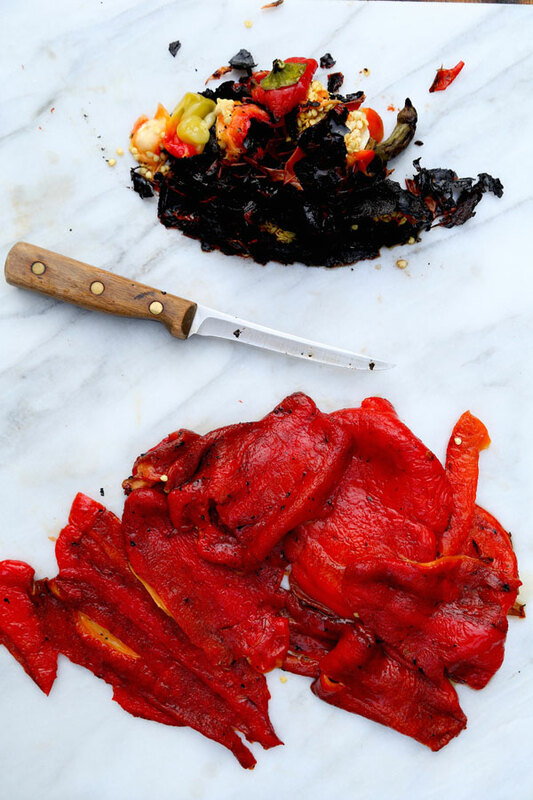 Once your roasted peppers are skinned, and seeds removed, you can roughly chop them into pieces. Roughly chop the garlic and parsley as well. Now simply place all the ingredients in the food processor and pulse until you are satisfied with the texture. I like a coarse pesto but some people prefer a smooth and silky pesto, it’s up to you how much to blend it. 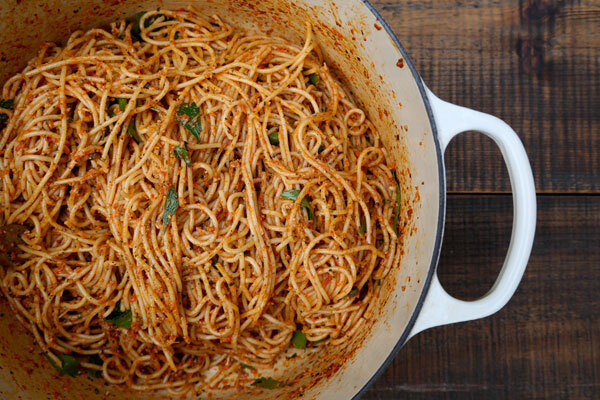 This pesto makes the perfect amount for 1 pound of pasta. Add it to the pasta once cooked and serve it with parsley and capers. You can also serve this pesto on bruschetta, on polenta, or even with an omelette. The possibilities are endless!